.-= aforkfulofspaghetti´s last blog ..ewe must try this: runny cheese fun with torta cañarejal =-. Well done on the spring clean! .-= Jan´s last blog ..Would you like to see my buns? =-. Your vodka recipe is absolutely awesome. I’m going to give this a go at the earliest opportunity and I am really not kidding. Nice pantry too. and a pink carrier bag holder…. and yes, the voddy is ADDICTIVE! Oh for a pantry, especially one filled with such yummy things. Luckily, given what I said earlier about my rhubarb, I have some rhubarb vodka left over from last year. I’ve also got some chilli and cinnaomon vodka which is really hot and works well with just a teaspoon added to a glass of something else. I like a Forkful’s Cocoa Vodka, so might have to try that next. .-= Choclette´s last blog ..Chocolate & Peppermint Cupcakes =-. Linda, ignoring the shoe fetish, and the Mac and WordPress evangelism, I reckon we could be twins! PS I spot one of my jars in there, haven’t you eaten it yet?! .-= Kavey´s last blog ..Cooking A Crab! =-. 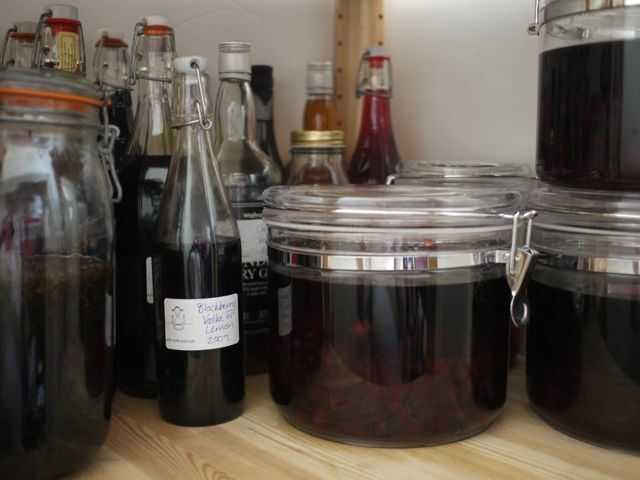 Great recipe for fruit vodka – definitely something worth locking yourself in a pantry with! 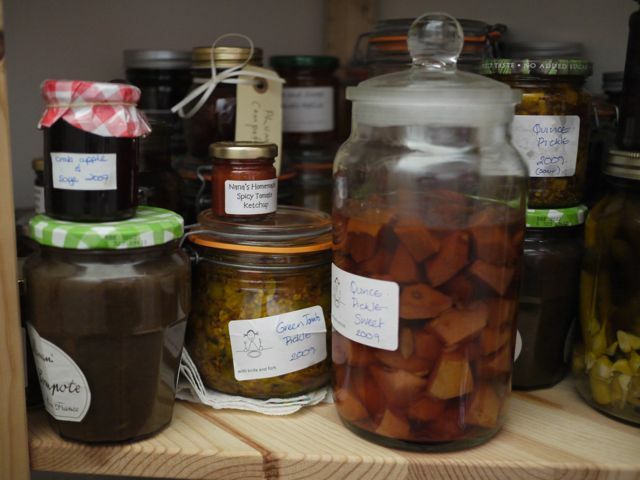 Oooh, I do love having a sneaky peak into someone else’s cupboards, your pantry is wonderful! 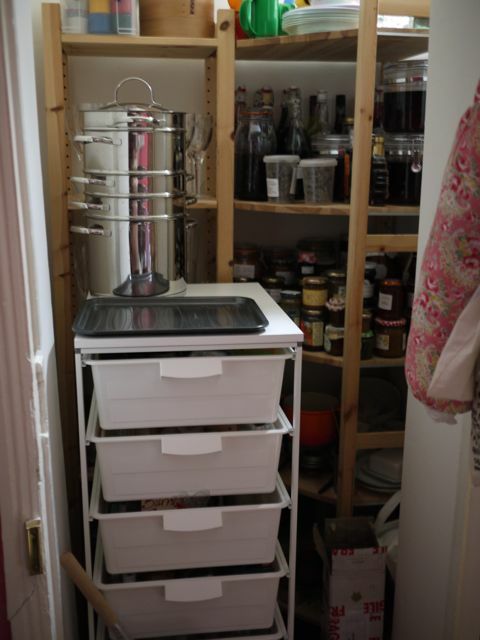 I love a good tidying session… but where did you put all the stuff?! .-= Alex´s last blog ..Crocheted tie =-. Your house sounds very much like mine, with things finding a ‘home’ in the most unusual and unexpected of places until I get round to doing a major tidy up. Doesn’t help though that my ‘office’ space is based in my pantry!! Although I do (oddly) rather like it there. Love the sound of the vodka. I must make some this year. .-= George@CulinaryTravels´s last blog ..If Life Throws You A Lemon =-. A forkful: I’m going to try rhubarb vodka this year too and interested to know how the cocoa nib turns out. Jan: rather too many goodies possibly for two people may be I need to work out a way to swap some of them for different things! Helen: It really is lovely and makes a great mixer with fizzy wine. I do love having a pantry wish it was HUGE though. Nic: Sneaky peaks are great aren’t they. When there are houses for sale in our road I always want to pretend I am buying just to get a look. I don’t actually do that of course I just wish I could! Alex: well some got thrown away and some got put in the cellar and some of it was just being more organised with the space Sadly there are lots of other bits of the house still to tackle.